Roy Spencer and John Christy have finally, nine years later than first mentioned, released version 6.0 beta of the UAH temperature record. Deniers will be delighted. Here is a comparison of v5.6 and v6.0 together with RSS. 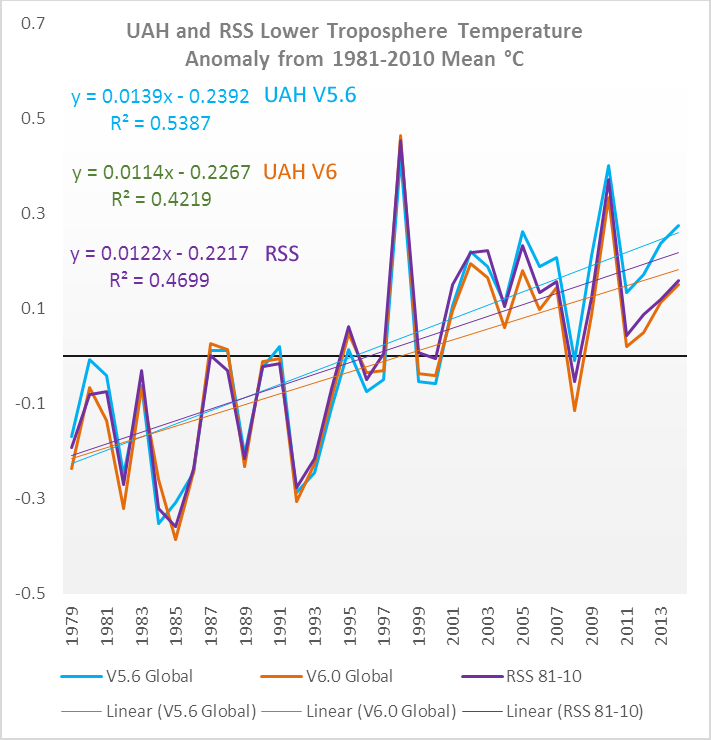 UAH v6 is now a touch cooler than RSS and the trend isn't as steep. However v6 beta lines up better with RSS for the last couple of years. You can read about it on Roy Spencer's blog - I've archived his description of the changes here. That's weird. Spencer says it took them 3 years of work. So what have they been doing the rest of those 9 years? Waiting for a divine intervention? You mean they *adjusted* the data? the horror! "most of the software has been rewritten from scratch" - now that one can find the source code as of 2011, it can be said that rewriting it from scratch was probably a good idea. And a fairly painful process given the rather primitive state of the previous code. It should make it a lot easier for them to move forward in the future, though (assuming they've done a good job of rewriting it). BTW this is yet another round of futzing UAH (though much more major than previous futzing, at least in regard to having rewritten the entire program) that vindicates the general impression that RSS's results have consistently been more robust than UAH's. Now UAH v6 beta is *cooler* than RSS, which is extremely puzzling. It's a red flag indeed. No mention of those misgivings now. Let's go with spurious cooling, at least until Spencer releases his paper and refs. V6 has some major changes from V5.6, in particular going from a multiple angle view calculation to one based on combinations of multiple channels in the same view for tropospheric temperatures, the LT or TLT that is the basis for most of the arguments regarding temperature records. With very large resulting changes in regional trends, particularly the US and the Arctic (where the recent trend is almost a factor of 2x smaller than in 5.6). If the UAH group has done their job well, the correlation with RSS may indicate issues with our understanding of upper tropospheric warming. If they haven't, and it may be a while before UAH releases the code for the beta V6, then there will be more nonsense from deniers. I hadn't bothered to check the yammerheads, but you're entirely correct. Already done. With very large resulting changes in regional trends, particularly the US and the Arctic (where the recent trend is almost a factor of 2x smaller than in 5.6). That is... troubling. Polar amplification is apparently strongly expressed in Arctic surface temperatures so far as they are known. This beta really does worry me. But no doubt it will be subjected to considerable scrutiny by the expert community. The hell it will, they are going to hide the cheese (the code) as long as they can and longer. Everybunny should hammer Dr. Roy on this and questions should be asked in Congress. How are Rabetts going to have any faith in the UAH hocus pocus without a good auditing? Perhaps with the latest changes UAH is no longer an outlier wrt tropical TMT trend? A question: why aren't other groups doing their own satellite data set, rather than just Spencer and Christy? RSS is doing just that, but they are dependent upon the same small set of satellite measurements (microwave emissions from oxygen proportional to temperature) as UAH. Their processing is, however, different, as is their determination of data quality for the various instruments. There have been other examinations of the data and algorithms used to derive temperature, such as the work from Stephen Po-Chedley and Qiang Fu, who have discussed potential (and primarily cooling) biases in the UAH data, but in essence everyone is working from the same primary data. Actually, that's not entirely correct - in addition to microwave sounders there are (as discussed by RSS) other upper atmosphere temperature measures such as radiosondes, IR sounders, and GPS radio refraction, but each has different challenges with sampling coverage, sensitivity to clouds, changing instruments, and length of observations. It's difficult to draw direct comparisons. One point that hasn't been mentioned yet, is the elimination of the first 2 kilometers of air, the atmospheric boundary layer, from the lower troposphere, which might be accurate by textbook, in version 6 beta. In Roy Spencers blog article he writes about reducing the influence of "earths surface skin layer " temperature to LT temperatures, which sounds harmless enough, but means leaving a gap between measurement by thermometer and satellite msu starting at 2 kilometers up to 8 kilometers high. The LT of version 6 beta has become quite a different thing and should be regarded as such. "Earths surface skin layer"? Sounds like a bit of a contradiction for where a lot of weather happens. Plus how does that then relate to air temperature over the ocean, I am aware GIS etc "fudge" the sea surface air temperature a bit, but the fudge seems reasonable. I did challenge some deniers a while back to demonstrate to me the lower troposphere estimates were a reasonable proxy for surface temperatures but I never got a response. So I guess I will just wait for a paper or two to be published.